Prepare the base – The base adds volume and texture to the salad so it is important to choose foods that are rich in fiber and complex carbs. You can opt for whole grains, left over quinoa, brown rice, beans, lentils, lettuce, kale, arugula, spinach, Brussels sprouts or shredded vegetables. Add some proteins and healthy fats – Proteins and fats form an important part of any dish because it helps to increase satiety. You can toss in a cooked or boiled egg, crunchy bacon, left-over chicken, salmon, chickpeas, crumbled cheese, nuts, seeds or avocado. 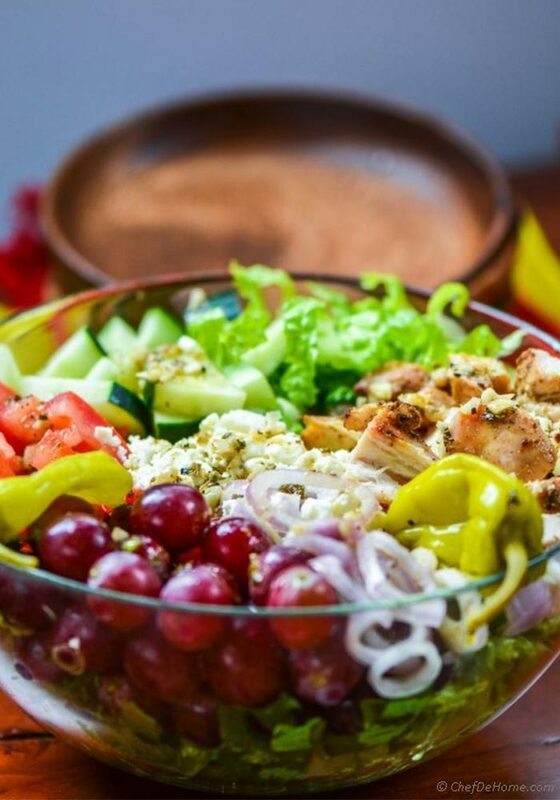 Enhance the texture – Salads are an extremely versatile food that has the potential to cover your sweet, savory and spicy cravings all at the same time. So feel free to layer different textures by throwing in tangy-tart berries and raisins, crunchy nuts, creamy Greek yogurt and rich sour cream. Don’t forget the dressing – Dressings add the finishing touch of quintessential flavors to the salad, but because its breakfast, so it is best to keep it simple. You can drizzle some extra virgin olive oil or balsamic vinegar along with a sprinkle of sea salt and black pepper and a dash of herbs like oregano, thyme, rosemary, dill, parsley and basil. This is a flavorful and easy fruit and veggie breakfast salad that is loaded with the goodness of fresh fruits and leafy greens. It is packed with protein, antioxidants, fiber and other essential nutrients that are required to kick start the day on a healthy note. It is absolutely non-oily and non-spicy. The only dressings used in this salad are lemon juice and peanut butter that helps to keep it light and simple. Spinach – Spinach is a low-fat, low-cholesterol leafy green that is packed with protein, fiber, B-complex vitamins, Vitamins E, K, iron, potassium, phosphorus, copper, etc that do a lot of good to your body. The flavonoids in spinach helps to protect the colon from free radical damage, folate improves the functions of the cardiovascular system and magnesium helps to lower high blood pressure. Strawberries – These juicy red berries are packed with health benefits. The anthocyanins in strawberries promote weight loss by stimulating the breakdown of stored fat. The anthocyanins also help to boost memory. The antioxidants and flavonoids in strawberries neutralize inflammation and lower the risk of cardiovascular diseases. The anti-aging properties of strawberries make it beneficial for skin. Apples – Apples are one of the most widely consumed fruits around the world. It is a rich source of dietary fiber, antioxidants and flavonoids. The antioxidants help to reduce the risk of cancer, hypertension, diabetes and heart disease. The soluble and insoluble fiber in apples improves digestion and aids weight loss by increasing satiety. 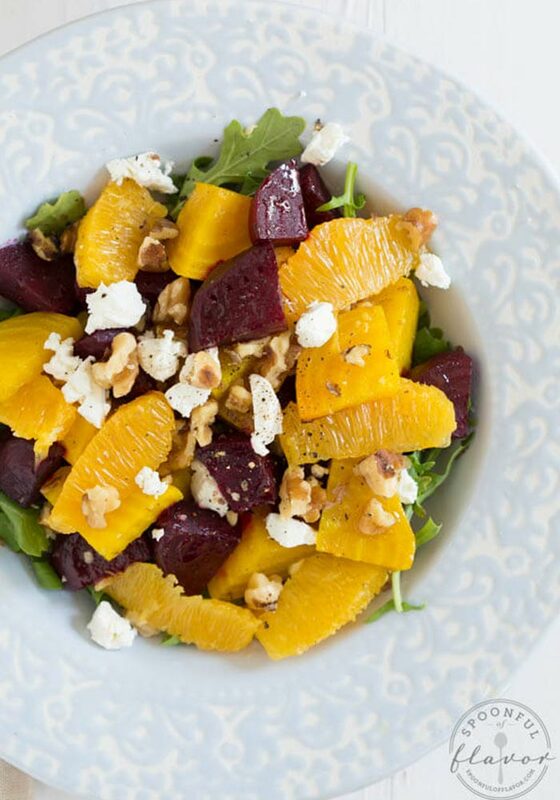 Indulge in the delicious and flavorful taste of this roasted beet and orange salad that makes a filling and nutritious breakfast. The mellow sweet taste of the beet blends well with the tangy taste of the oranges. The arugula and walnuts add a nice crunchy texture to the salad while the goat cheese adds a slight creaminess to it. Beet – Beets contains a variety of health-boosting nutrients that are necessary for healthy functioning of the body. The naturally occurring nitrates in beets help to lower blood pressure and help to improve stamina and endurance. Nutrient betaine found in beet protects the cells from environmental damage and protect against inflammation. Powerful phytonutrients in beet helps to ward off cancer. It is a rich source of fiber that helps to increase satiety. Oranges – Oranges are loaded with vitamin C which protects the cells from free radical damage and reduces the risk of chronic diseases like cancer and heart diseases. Vitamin A present in oranges reduces the risk of liver cancer, while the soluble fibers help in lowering cholesterol. Oranges are rich in potassium that helps to boost heart health. The acidic nature of orange juice helps to alkalize the body. Beta carotene found in oranges is essential for maintaining healthy and youthful skin. 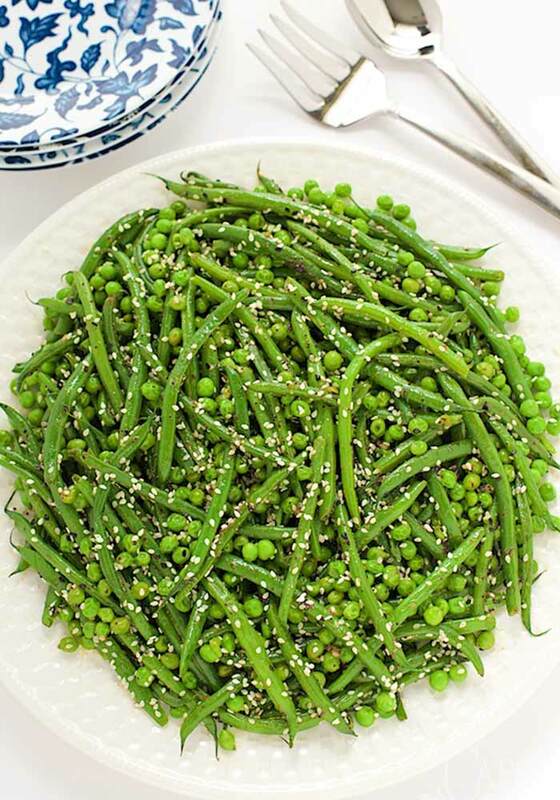 This Asian-inspired green bean, ginger and sesame salad makes a delicious and filling breakfast as well as a savory side dish that can be served with lunch or dinner. The ginger, oil, soy sauce and Sriracha sauce blend together beautifully to render an appetizing flavor and savory-sweet taste to the salad. The peas and sesame seeds add a nice chewy and crunchy texture to it. Green beans – These delicious and crunchy beans are packed with nutrients and extremely low in fat and calories and it contains no cholesterol. The flavonoids in green beans reduce the risk of heart diseases. High fiber content of green beans aids the digestive system and reduces the risk of colon cancer and gastrointestinal issues such as constipation, ulcers, hemorrhoids and acid reflux. The carotenoids found in green beans prevent macular degeneration and helps to improve eye health. Ginger – The antioxidant properties of ginger helps to reduce the risk of certain types of cancer and provides protection against age related decline of brain function. It can also protect against Alzheimer’s disease. Active ingredients in ginger help to fight off infections caused by bacteria. 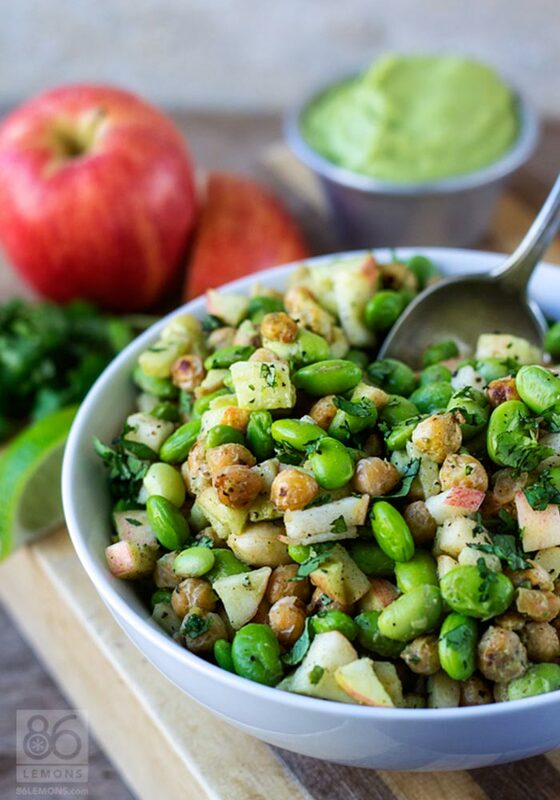 This delicious and crunchy vegan breakfast salad is teaming with the goodness of chickpeas, edamame, avocado, apple cider vinegar and flavorful herbs. It is a healthy and healthy gluten-free salad that can be enjoyed for breakfast or served as a side dish for lunch. It is packed with protein, fibers, vitamins and minerals that help to keep you satiated till the next meal. Chickpea – These nutty tasting legumes posses numerous health-giving qualities. It is a rich source of both soluble and insoluble fiber, folate and magnesium – all of which work together to improve cardiovascular health. Zinc and copper found in chickpeas help to boost immunity and reduces the chances of flu and fiver. Fiber and protein present in chickpeas helps to increase satiety and promotes weight loss. Edamame – Edamame is a good source of proteins, fiber, carbohydrates and other essential nutrients that are necessary for the human body. The antioxidants in edamame help to maintain healthy skin and repair the damage caused by free radicals. The antioxidants help to strengthen the immune system so that body can fight against microorganisms. Calcium, phosphorus, iron and vitamin E present in edamame help to maintain healthy and strong bones. High protein and low calorie content of edamame makes it an ideal weight loss food. 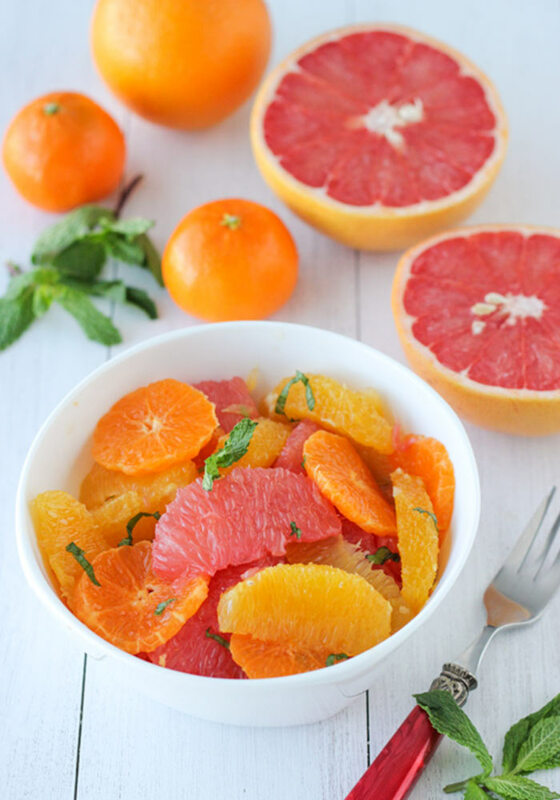 What better way to start the day that with the refreshing tangy taste and citrus aromas of grapefruit and orange salad? The sweet and tangy taste of the salad works for a healthy dessert as well that helps to satisfy your sweet tooth without adding any extra calories. The honey adds a mellow sweetness to it while the mint enhances the flavors of the salad. Grapefruit – Grapefruit is a potent source of vitamin C that gives a significant boost to the immune system and helps to relieve flu and fever. It is a natural fat burner that boosts metabolism and speeds up the calorie burning process. It works as a liver cleanser and helps to get rid of toxins from the body. The antioxidants provide protection against prostate cancer. Mint – Refreshing and flavorful mint leaves are great appetizer that promotes digestion and soothes inflammation in stomach. The strong aroma of mint helps to relieve nausea and headache. It works as a natural stimulant that helps to improve brain functions and boost the mood. 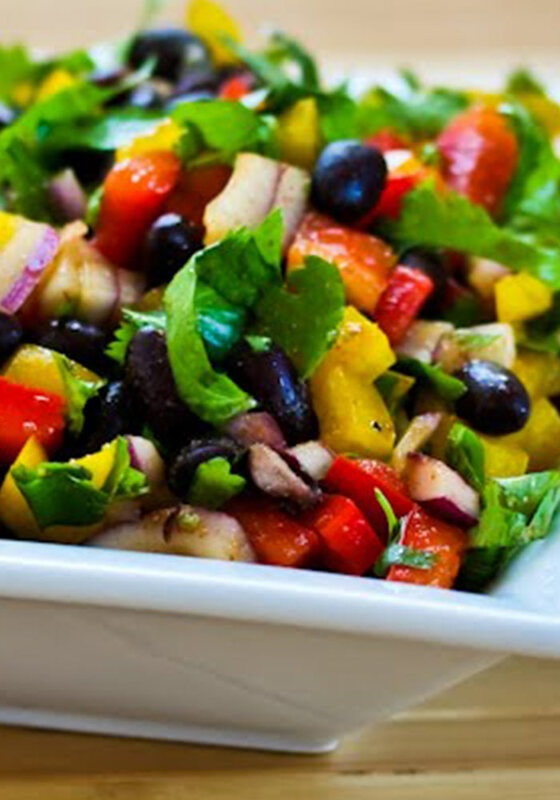 A filling and nutritious breakfast salad packed with lots of yellow and red bell peppers and black beans is the best way to begin the day and stay satiated till the next meal. The mixture of spices along with the freshly chopped cilantro heightens the flavors of the salad and renders a delicious savory touch to it. The vibrantly colored bell peppers not only add a nice crunchy texture to the salad, but also enhance its appearance. Black beans – Black beans are a rich source of minerals iron, phosphorus, calcium, magnesium, manganese, copper and zinc – all of which are necessary for maintaining healthy bones and strong bone structure. Potassium, calcium and magnesium content in black beans helps to lower blood pressure naturally. The dietary fibers in beans help in managing diabetes while folate and vitamin B6 wards off heart disease. Cilantro – This green herb contains good amounts of antioxidants, essential oils, vitamins and dietary fiber which help to reduce LDL cholesterol in blood and protects the heart. It is a good source of minerals potassium, calcium, manganese, iron and magnesium that help to regularize heart rate and aids red blood cell production. Vitamin K found in cilantro aids bone mass building and reduces the risk of osteoporosis. 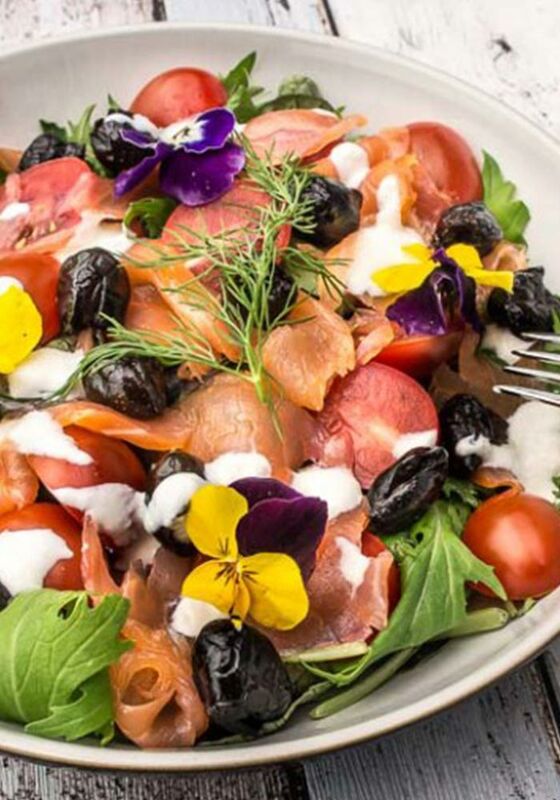 This delicious and scrumptious smoked salmon salad may look fancy but it takes only 10 minutes to prepare and it is absolutely filling and healthy. Most of us don’t think of eating fish for breakfast, but salmon is a rich source of protein, fiber and healthy fats that helps to keep you full and curb hunger till the next meal. The lemon juice, cherry tomatoes and olive add a nice tangy-tart taste to the salad while the salad leaves add some crunch to it. Salmon – Salmon is packed with proteins, omega 3 fatty acids, vitamins D, A, B-complex vitamins along with selenium, zinc, phosphorus, calcium and iron. Omega-3 fatty acids, vitamin D and selenium work together to boost metabolism and manage insulin level in the body. The fatty acids also help in improving cardiovascular health and enhance efficiency of brain functions. The amino acids and fatty acids also prevent macular degeneration, retinal dryness and loss of vision. Olives – Olives contain an abundance of phenolic antioxidants that provide protection against colon, breast and skin cancer. The biophenols suppress the synthesis of LDL cholesterol and reduces the risk of cardiovascular disease. Anti-inflammatory properties of olives reduce muscle pain, while the antimicrobial properties help to protect against stomach ulcers. 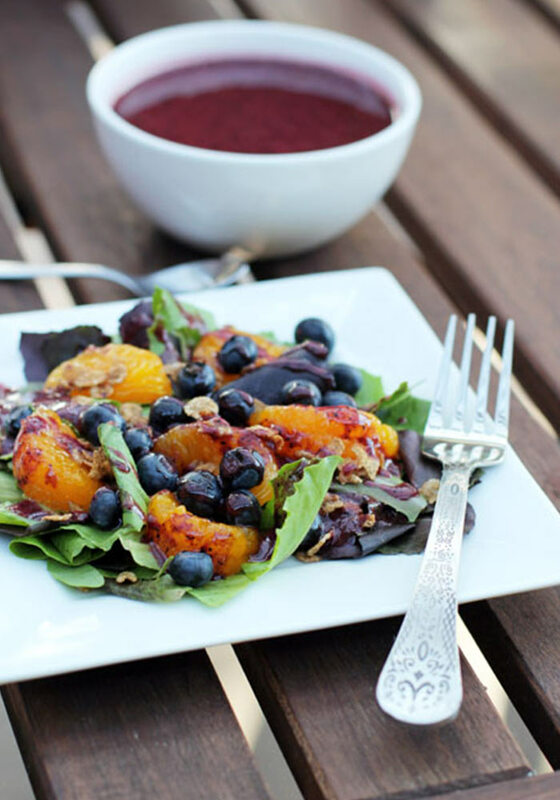 Get an instant energy boost at your breakfast with this delicious blueberry breakfast salad packed with the goodness of berries, leafy greens and granola. The tiny berries are packed with flavor and antioxidants that help to energize the body and mind. The oranges render a refreshing citrus aroma and tangy zest to the dish. The granola adds some volume and nice crunchy texture to the salad. Blueberries – Fresh and juicy blueberries are packed with antioxidants, calcium, magnesium, manganese, zinc and vitamin K. The minerals help in building and maintaining strong bone structure. Potassium and magnesium found in blueberries help to decrease blood pressure. Vitamins A and C along with other phytonutrients help protect the cells against free radical damage and prevent the growth of cancerous tumor. Granola – This popular breakfast cereal is packed with dietary fibers, potassium, zinc, phosphorus, magnesium, calcium, vitamins E, C, niacin and thiamin. Soluble and insoluble fiber present in granola aid digestion and reduces the risk of constipation, indigestion, heartburn, flatulence, diarrhea and colorectal cancer. Soluble fiber in granola help to reduce harmful LDL cholesterol, while iron helps to relieve anemia. This is a quick and easy breakfast salad recipe that can be prepared in a jiffy and is ideal for those mornings when you are running late. It not only tastes delicious, but is packed with the goodness of potatoes and herbs. 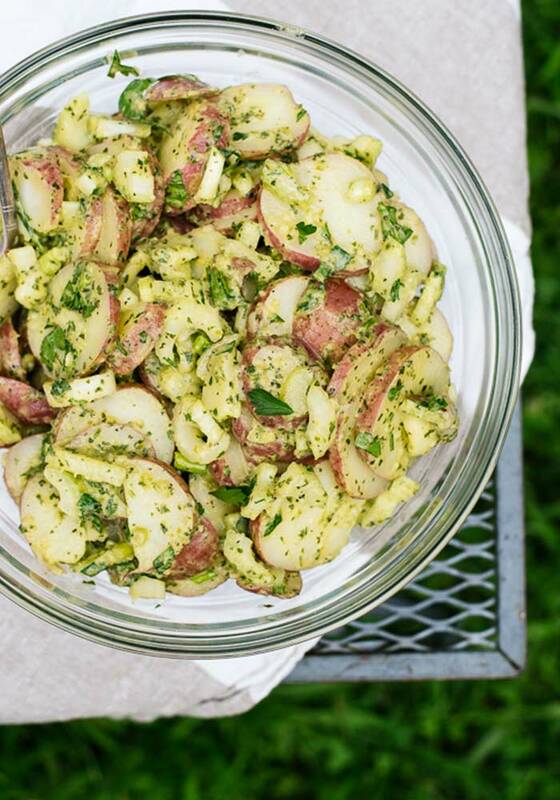 The dressing of olive oil, parsley, mustard, garlic and black pepper blends together to beautifully cover the potatoes and render an appetizing flavor to the salad. The celery adds a nice crunchy texture to it. Potato – This one of the most popular and widely grown vegetable around the world. Potatoes are a storehouse of energy and nutrients that includes vitamins, minerals, carbohydrates and fiber. The carbohydrates in potato work as an amazing source of energy and aid digestion. Vitamin C present in potatoes is essential for skin care and it can also prevent scurvy. Minerals calcium and magnesium present in potatoes help to relieve rheumatism. High levels of antioxidant flavonoids and vitamin A provides protection against many types of cancer. Celery – Celery is a rich source of antioxidants, vitamin K, vitamin C, vitamin B6, folate and potassium. Unique compound called 3-n-butylphthalide (BuPh) found in celery helps to lower cholesterol levels in blood. The antioxidants help to neutralize inflammation and reduce the risk of chronic diseases like cancer, arthritis, heart diseases, etc. A special type of ethanol extract present in celery helps to prevent and reduce the formation of painful ulcers. Celery protects liver health and reduces the amount of fat buildup within the liver. A plate of hearty quinoa salad perked up with Moroccan salad, raisins and nuts is the ultimate comfort food for starting your day. The lime zest, paprika, cumin, coriander and black pepper add some wonderful flavors to the salad, while the nuts and raisins add a nice chewy and crunchy texture to it. The avocados add a rich creamy texture. 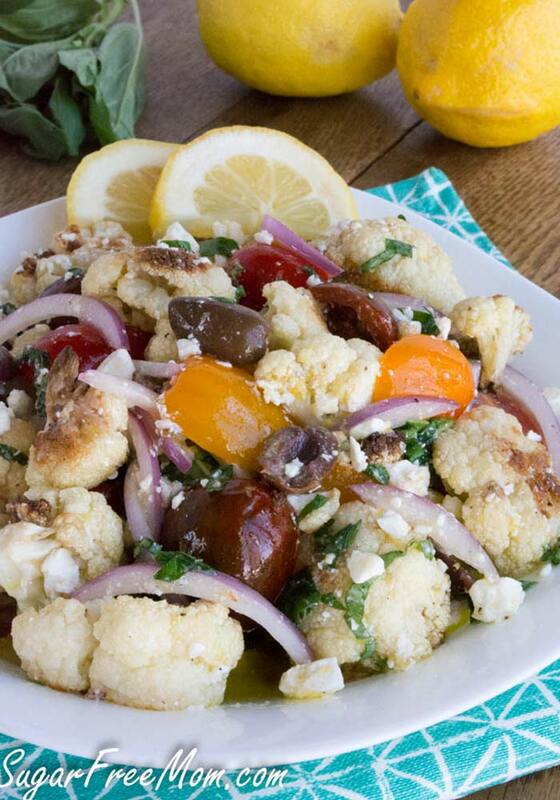 The lemon juice adds a refreshing tanginess to it and the olive oil enhances the aroma of the whole dish. Quinoa – Quinoa is a nutritionally dense seed that is one of the most popular food choices for health conscious people. Flavonoids along with quercetin and kaempferol found in quinoa have numerous health benefits. It is rich in dietary fiber and proteins that help to keep you satiated and curbs hunger pangs. 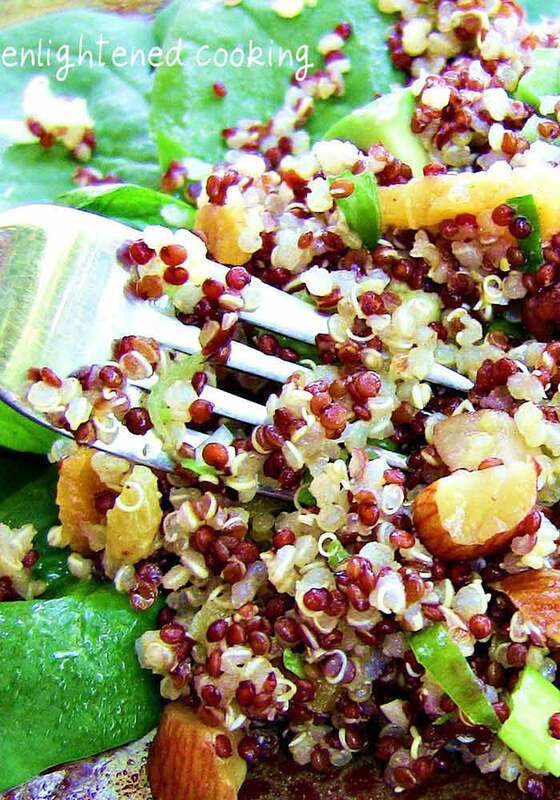 Minerals such as iron and magnesium found in quinoa help to relieve iron-deficiency anemia. Quinoa is also useful for improving metabolic health and lowering blood pressure and triglyceride levels. Avocado – Avocado is an incredibly nutritious fruit packed with proteins, fiber, healthy fats, vitamins and minerals. It contains heart-healthy monounsaturated fatty acids that improves cardiovascular health and reduces stubborn belly fat. The high antioxidant profile of avocado improves eye health and lowers the risk of macular degeneration and cataracts. Give a break to the same old breakfast cereal and try something new for breakfast with this pomegranate breakfast salad. It may look like a high-end restaurant salad but it is extremely easy to make and is hearty and healthy at the same time. 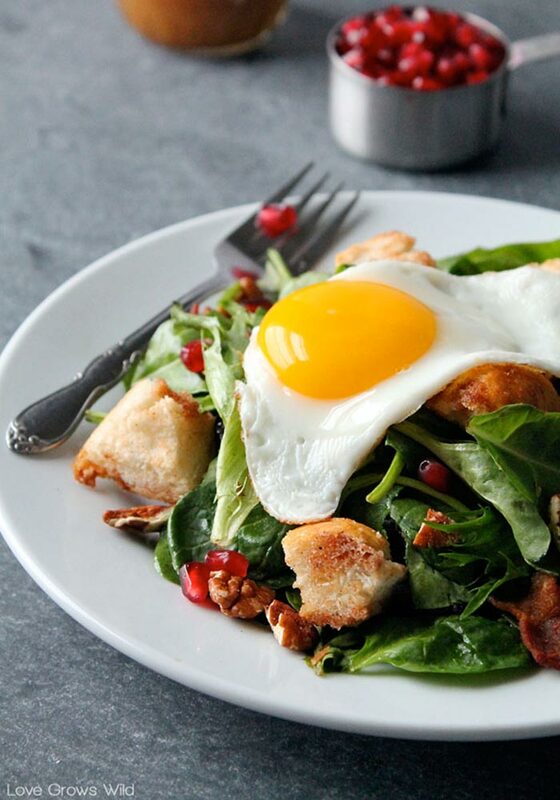 The addition of eggs and bacon provides a power-packed protein and fiber punch to the salad. The pomegranate seeds add a nice tangy touch to the dish while the pecans add some nutty crunch to it. Pomegranate – Pomegranate has amazing anti-inflammatory effects that can help to lower the risk of many killer diseases such as heart disease, type 2 diabetes, Alzheimer’s disease and obesity. Pomegranate juice has the capacity to inhibit cancer growth and reduce the risk of prostate cancer in men. Pomegranate extract can help fight breast cancer cells. An anti-inflammatory property of this fruit is beneficial against joint pain caused by arthritis. Bacon – Bacon is a rich source of high-quality protein that is necessary for maintaining energy levels and improving body composition. Bacon can help in lowering blood pressure and sugar levels and alleviate the effects of diabetes and heart disease. Being a rich source of protein, it helps to increase satiety and boost metabolism which help in weight loss. Choline found in bacon helps to enhance memory and intelligence. 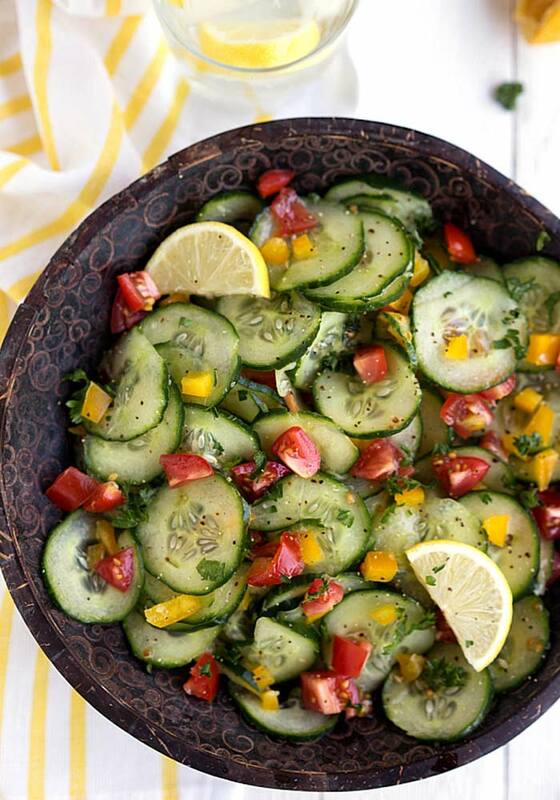 What better way to refresh and rehydrate yourself that with this cool and flavorful lemon cucumber salad? This light and appetizing salad can be enjoyed with crunchy toast for breakfast or served as a perfect side dish with lunch or dinner. Cucumbers, tomatoes, bell peppers, lemon and parsley make a pretty delicious and appetizing combination. The olive oil and white vinegar dressing enhances the flavors of the dish without making it too heavy. Cucumber – One of the most important health benefits of cucumbers is that is helps to keep you hydrated. The water in cucumber helps to flush out toxins from the body and dissolve kidney stones. Vitamins A, B and C boost immunity and supply energy to the body. Anti-inflammatory flavonols called fisetin protect the brain and nerve cells from age-related decline. Lemon – Lemon along with its rinds is a rich source of vitamin C that boosts the immune system and speeds up the recovery from cold and fever. It also protects the cells against free radical damage. Citric acid in lemons balances the pH of the body and restores it to a healthy alkaline state. Lemons stimulate brain activity and give an instant boost of energy. Its natural detoxifying properties dissolve uric acid and other toxins stored in the liver. 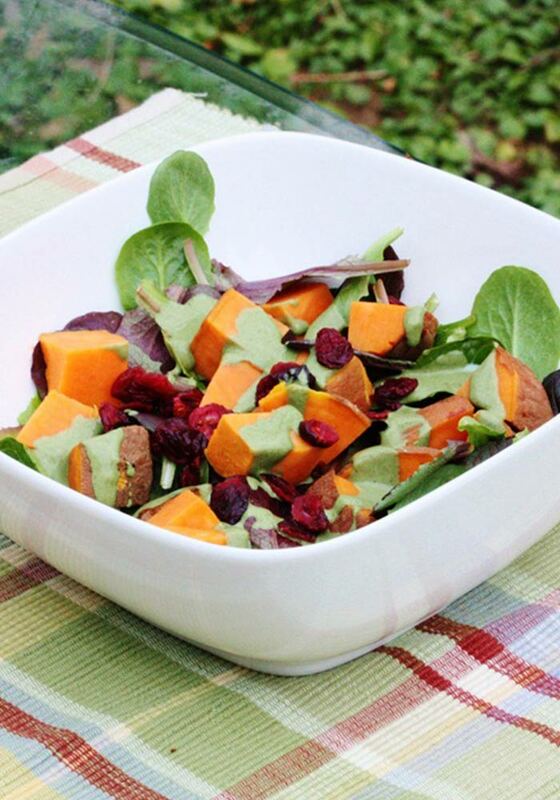 This vibrantly colored sweet potato salad is a great way to pack in some fruits and vegetables in your breakfast. It is a filling and hearty salad packed with fibers, protein and healthy fats that helps you to stay full till lunch. The delicious almond butter dressing adds a rich creamy texture to the salad with the leafy greens add a nice crunch to it. Sweet Potatoes – This readily available and inexpensive root vegetable has numerous health benefits. Vitamin B6 is sweet potatoes reduce the level of chemical homocystenine in the body. Increased level of this chemical is directly linked to degenerative diseases and heart attack. It is a good source of vitamin C that is necessary to ward off cold and flu viruses. It is also essential for maintaining the elasticity fo skin. It is a potent source of vitamin D which helps to build strong and healthy bones. Iron in sweet potatoes support healthy immune system and relives anemia. Anti-stress mineral magnesium found in sweet potatoes help to relax the muscles. Almond Butter – Almond butter is loaded with antioxidant vitamin E that neutralizes free radical damage. Magnesium present in almond butter helps in healthy functioning of the nervous system, facilitates muscle contraction and supports your metabolism. 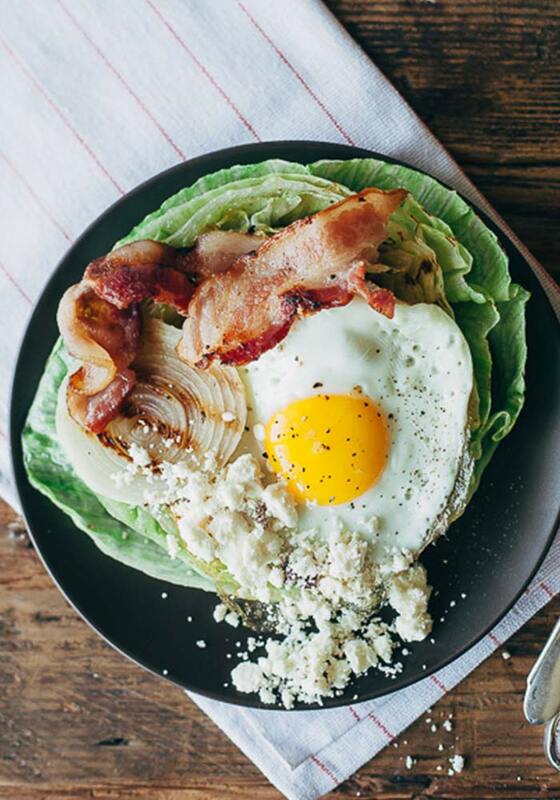 Indulge in the appetizing taste of grilled wedge salad layered with bacon, onions, cooked eggs and crumbled feta cheese. This is a wholesome and healthy breakfast salad that contains all the nutrients in the right proportion – proteins, fiber, vitamins and minerals. The egg and bacon combine together to give a nice texture and yummy flavors to the dish. The olive oil and onions enhances the flavors of the salad with the feta and cranberry seasoning adds a tangy-tart touch to it. Lettuce – Lettuce is considered the perfect weight loss food because it exceptionally low in calories and contain zero fat. It is packed with fiber and cellulose that helps to fill you up and improve digestion. Vitamin C and beta-carotene found in lettuce work together to prevent oxidation of cholesterol and maintain heart health. Lactucarium present in lettuce helps with insomnia. It helps in relaxing the mind and body and brings restful sleep. The minerals in lettuce detoxify the body and help to restore the pH balance. Feta – The strong flavors of feta helps to enhance satiety even with small portions. It is a rich source of calcium, riboflavin, phosphorus, vitamin B6, selenium and zinc – all of which are beneficial for maintaining overall health. This nourishing, modest and wholesome breakfast salad is packed with the goodness of fresh produce such as leafy greens, tomatoes, eggs and cheese. It takes only a few minutes to prepare and is ideal for those busy mornings when you don’t have time to prepare elaborate breakfast. 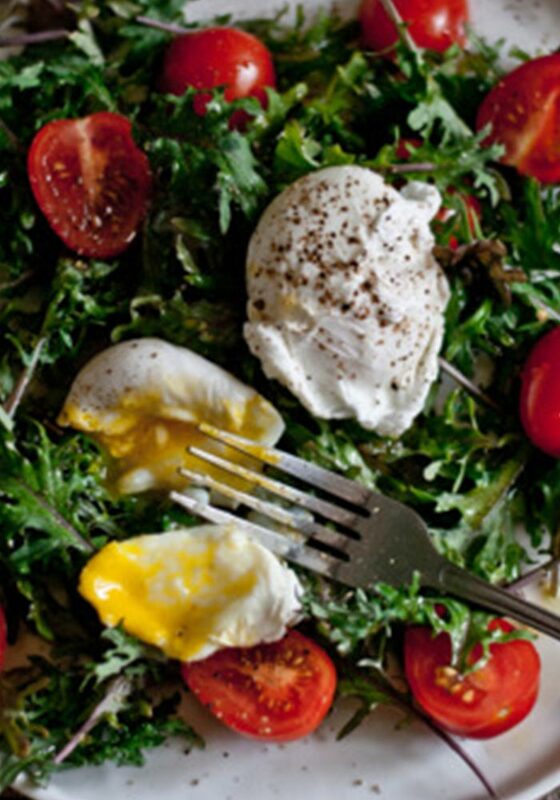 The tomatoes add a nice tangy taste to the salad while the soft egg yolk renders a rich creamy texture to it. Kale – Kale is the most nutrient-dense leafy green packed with antioxidants, fiber and vitamins. The antioxidants quercetin and kaempferol found in kale counteract oxidative damage caused by free radicals and reduce the risk of cancer. It is a rich source of vitamin C that is necessary for collagen synthesis. It is the best source of vitamin K that is critical for blood clotting and activating the proteins that bind calcium. Nutrients lutein and zeaxanthin in kale reduce the risk of cataracts and age-related macular degeneration. Cherry Tomatoes – Cherry tomatoes are extremely nutritious and are a rich source of vitamin B6 and vitamin A. Vitamin B6 plays a key role in metabolizing protein in the body and supporting cognitive development and brain functions. Vitamin A helps in maintaining eye health and supporting the functions of heart, lungs and kidneys. It also aids the production of white blood cells. This amazing and delicious broccoli salad is packed with mouth-watering flavors and rich texture that is sure to brighten your day. The combination of broccoli, carrots, pecans and apples along with a creamy topping of mayonnaise and Greek yogurt makes it absolutely spectacular. 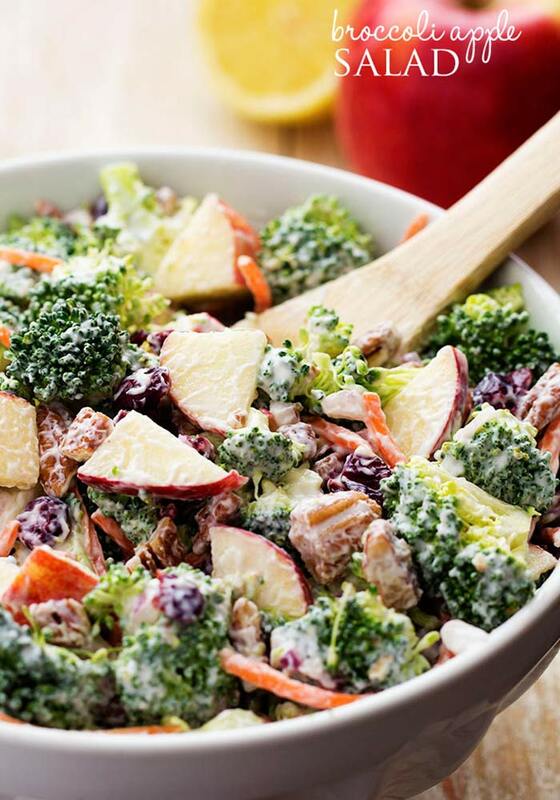 The apples and broccoli add a nice crunch to the salad while the pecans add a nutty taste. The mayonnaise and Greek yogurt blend together to add a rich creaminess to it. Broccoli – This cruciferous vegetable has an impressive nutritional profile and it offers a plethora of health benefits. The compound sulforaphane found in broccoli helps to relieve arthritis and prevent osteoporosis by blocking an enzyme that damages cartilage. Sulforaphane also kills cancer stem cells and prevents tumor growth. It significantly improves blood pressure and supports kidney functions. Pecans – Pecans are one of the most popular tree nuts packed with fiber, minerals and healthy fatty acids. The fiber found in pecans cleanses the gastrointestinal system and promote digestive health which in turn reduces the risk of colon cancer, colitis and hemorrhoids. The healthy monounsaturated fats help to prevent stroke and coronary artery disease and also reduce the risk of breast cancer. Magnesium found in pecans reduces blood pressure and also curbs inflammation. 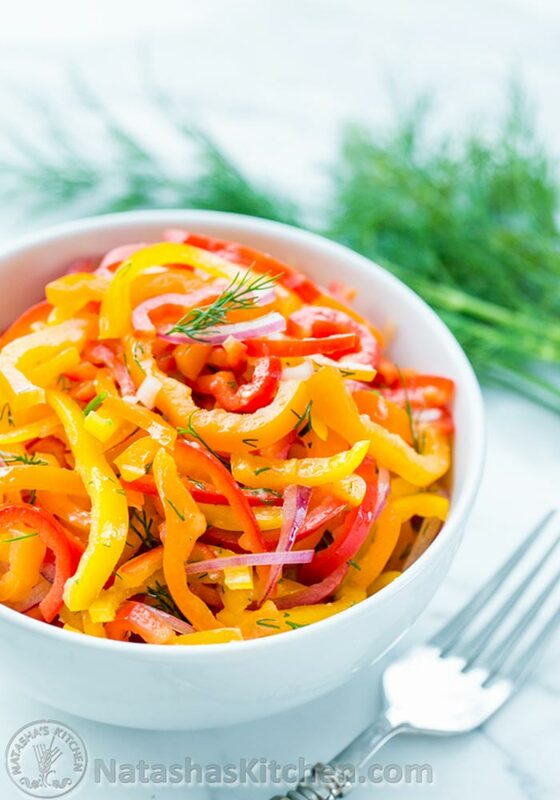 This bright and colorful bell pepper salad not only tastes great, but also packs in a lot of health benefits. The combination of sweet, tangy and savory tastes tantalize your taste buds while the fresh dill adds some refreshing flavors to it. It tastes amazing over crisp toast or as a sandwich filling. It tastes delicious even after refrigerating, so you can enjoy the left-over the next day. Bell Peppers – The brightly colored peppers are a superfood for your health because they are extremely low in calories and high in vitamin C and A. They also contain several phytochemicals and carotenoids that help to boost the immune system and neutralize inflammation. Capsaicin found in bell peppers reduces harmful LDL cholesterol in blood, control diabetes and relieves pain caused by inflammation. Sulfur content in bell peppers helps to protect against certain types of cancer. Vitamin B6 found in bell pepper plays an important role in cell regeneration and maintaining healthy nervous system. 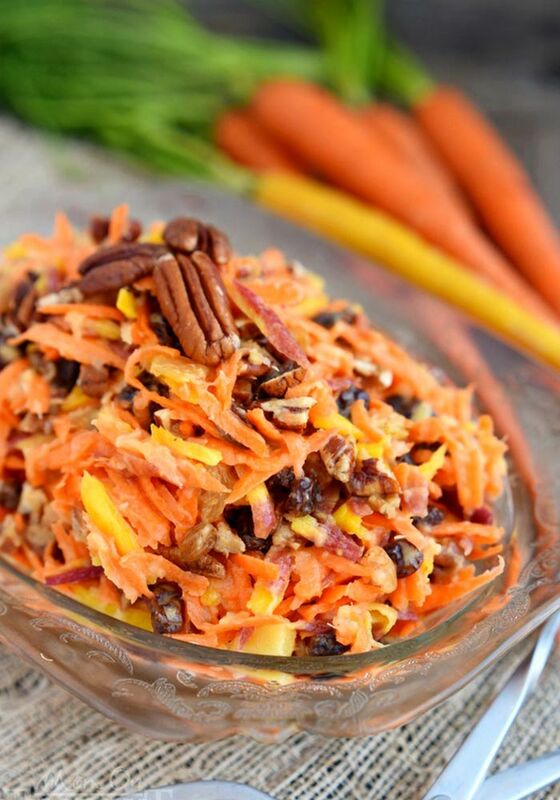 The 5 minutes rainbow carrot is extremely easy to prepare and it makes a delicious and filling breakfast as well as a perfect side dish for meals. The pineapple adds a refreshing fruity flavor and sweet-tart taste to the salad, while the raisins and pecans render a nice chewy and crunchy texture to it. It does not contain any dressing, spices or oil which makes it absolutely light. Carrots – The myriad health benefits of carrots makes it a popular vegetable around the world. Large amounts of soluble fiber found in carrots help to lower cholesterol in blood. Alphacarotene and bioflavonoids present in carrots lowers the risk of lung cancer. Carrots are loaded with beta-carotene that is converted in to vitamin A in the body. Vitamin A helps to keep your vision sharp. It also protects the central nervous system and prevents age-related cognitive decay. Raisins – Raisins are a concentrated source of nutrients, carbohydrates and energy. Raisins are low in calories and contain no fat. Raisins are a great source of iron that supports hemoglobin formation. It is also beneficial for the immune system and formation of amino acids that boost metabolism. Potassium found in raisins aid muscle contraction and stimulates nerve impulses. Potassium also regulates the heart beat and lowers blood pressure. 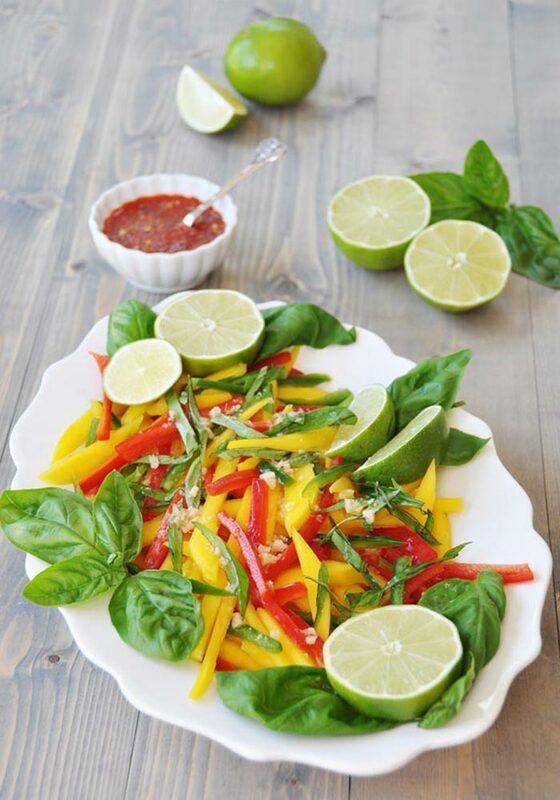 This gorgeous Thai mango salad with ginger-lime dressing is a refreshing way to start your day during the summer season. The combination of mangoes, bell pepper, Jalapeno, ginger and lime juice creates a sweet, spicy and tangy salad that tastes simply amazing. It is colorful, tasty, healthy and filling. Enjoy it over toast or with rice bowl or pasta. Mangoes – The king of fruits has a wide range of health benefits. It is packed with antioxidants like quercetin, isoquercitrin, astragalin, fisetin, gallic acid and methylgallat that protect against breast cancer, colon cancer, protest cancer and leukemia. Vitamin C in mangoes helps to lower cholesterol levels in the blood. Vitamin C promotes good eye health and prevents night blindness and dry eyes. The acids present in mangoes alkalize the body. The enzymes in mangoes promote better breakdown of protein and improves digestion. The vegetarian roasted cauliflower salad is a delicious, flavorful and wholesome dish that works as a filling breakfast and perfect entree that can be served with the main course. The crunchy roasted cauliflower florets covered with tangy and savory olive oil and lemon juice dressing makes it a extra-ordinary dish that will be enjoyed by the whole family. This salad recipe takes a little time to prepare and is ideal for the laid-back weekend breakfast. Cauliflower – This is an extremely versatile vegetable that can be enjoyed raw, roasted or mashed. A sulfur compound sulforaphane present in cauliflower has been shown to kill cancer cells and slow down tumor growth. It is a potent source of choline that plays an important role in brain development. It improves cognitive function, learning and memory and diminishes age-related memory decline. It is an important source of dietary fiber that supports digestive health. This is a purely vegan and gluten-free breakfast salad recipe that contains the goodness of mushrooms and lentils. It is a healthy and filling dish teaming with flavors which makes it suitable for breakfast as well as lunch. 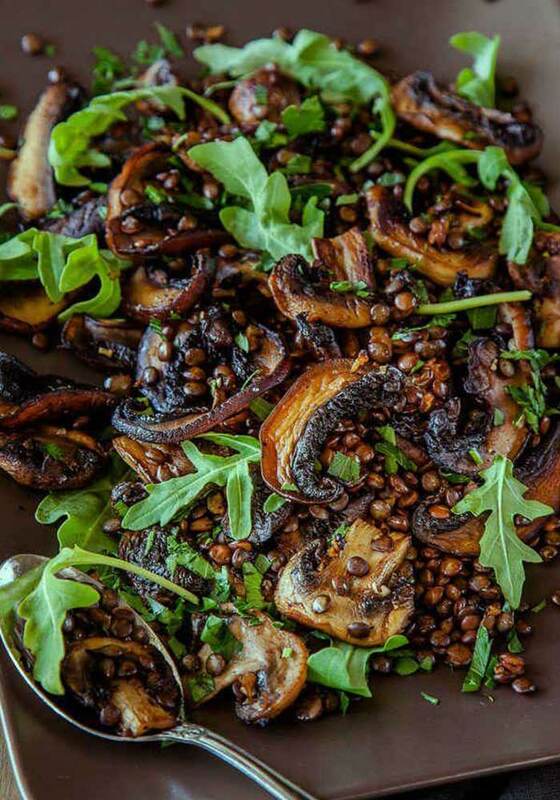 The mixture of Portobello mushrooms and button mushrooms along with the lentils renders a nice chewy texture to the salad. The lemon juice and parsley adds a dash of freshness to it. Mushrooms – All types of mushrooms are loaded with health-benefitting nutrients. Mushrooms are a good source of selenium, vitamin D and iron and they are low in calories. Mushrooms are the only vegetable source of vitamin D that helps in better nutrient absorption from foods and promotes metabolism. Mushrooms are a rich source of calcium which is essential for formation of strong and healthy bones. Fibers and certain enzymes present in mushrooms lower cholesterol levels and its high protein content promotes the formation of lean muscle mass. Iron found in mushrooms help to relieve anemia. French Lentils – Lentils contain high levels of soluble fiber that helps to reduce blood cholesterol and reduces the risk of heart diseases and stroke. Folate and magnesium in lentils also reduce the risk of heart disease and improves blood and oxygen flow to the body. It is a good source of protein for vegetarians and vegans. The fibers present in lentils improve digestive health and prevent constipation, irritable bowel syndrome and diverticulosis. This delicious chunky egg and avocado salad seasoned with lime juice, yogurt and green onions makes a mouth-watering breakfast recipe that the whole family will look forward to, including the kids. 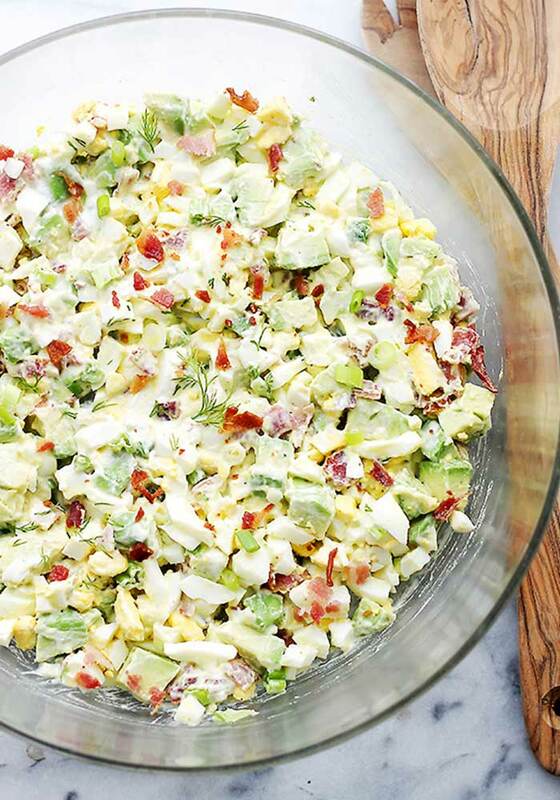 The cooked bacon adds a nice crunchy texture to the otherwise rich and creamy salad. It contains no oil or mayonnaise which makes it light and healthy. Enjoy it with crisp toast and pack up on proteins, fiber and other nutrients. Eggs – The humble egg is a rich source of proteins, vitamins, minerals and essential fatty acids. It raises the levels of healthy HDL cholesterol in blood which helps to reduce the risk of various diseases. Choline found in eggs help to improve brain functions. Antioxidants Lutein and Zeaxanthin found in eggs have major benefits for eye health. Omega 3 fatty acids found in eggs reduce the level of triglycerides in blood. Last but not the least, eggs are the cheapest source of high-quality protein that helps to build lean muscle mass and promote weight loss. 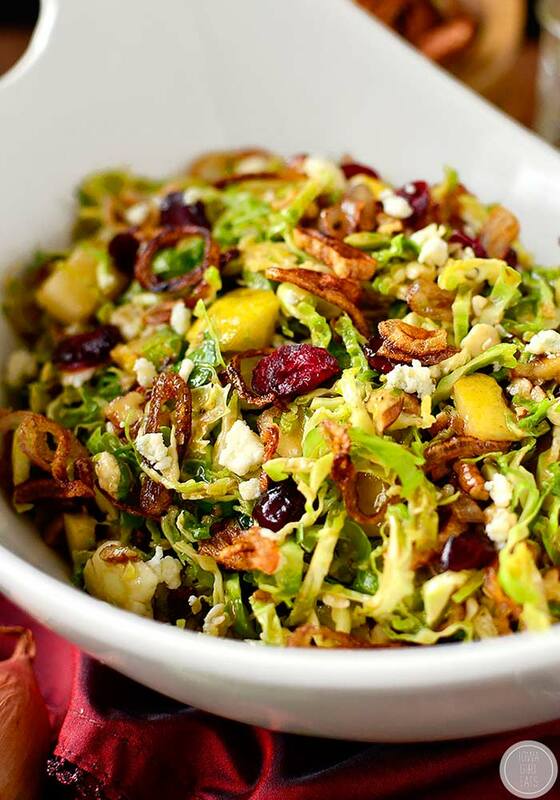 This healthy and wholesome Brussels sprouts salad not only makes the perfect breakfast, it can also be packed for lunch. The pecans and pear add a nice texture to the already crispy and crunchy salad. The home-made maple-balsamic vinaigrette renders a sweet-savory taste and appetizing flavors to it. The tasty yet low-oil dressing helps to keep it light and delightful. Brussels sprouts – Brussels sprouts are a filling and hearty food and yet extremely low in calories. It is a rich source of vitamin C which is required by the body for normal growth and development. It also helps in maintaining strong immune system. Vitamin C protects the cells against free radical damage and reduces the risk of cancer and heart disease. The dietary fiber sound in Brussels sprouts maintains healthy functioning of the digestive system, and encourages regular bowel movement. It is a rich source of folate that plays a key role in formation and maintenance of DNA. This is a clean carb-free chicken salad seasoned with Greek flavors that makes a hearty and filling breakfast. The combination of the chopped veggies provides a layer of texture to the salad. The savory and spicy Greek vinaigrette seasoning heightens the flavors of dish and makes it all the more appetizing. 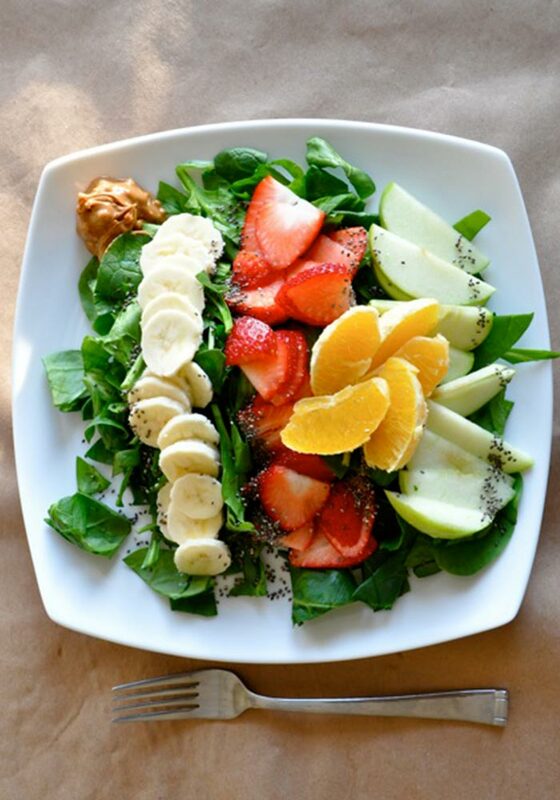 This is a complete salad packed with protein, fiber, vitamins, minerals and healthy fats. Chicken – Chicken is the best source of high-quality, low-fat protein that makes it an important part of any healthy diet. The protein is chicken helps in muscle growth and development and aids weight loss. It also fights against bone loss and reduces the risk of osteoporosis and arthritis. It contains plenty of phosphorus that supports strong teeth and bone and maintains healthy function of the liver, kidney and central nervous system. Selenium found in chicken promotes healthy functioning of the thyroid, hormones, immune system and metabolism. Vitamin B6 in chicken is a natural metabolism booster that promotes calorie burning and aids weight loss. 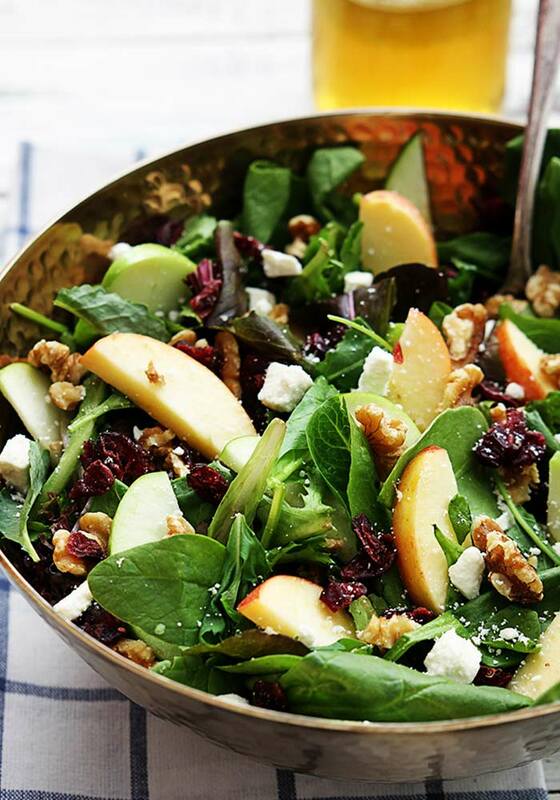 Your body is going to thank you for pampering it with the goodness of this healthy and delicious apple, cranberry and walnut salad right at the beginning of the day. The crispy and crunchy red and green apples seasoned with apple juice, honey and apple cider vinegar makes a delightful breakfast and a quick-fix side dish to accompany a main meal. The cranberries add a nice chewy texture to the salad while the walnuts render an appetizing nutty flavor to it. Apple – The flavonols present in apples curb all types of cancer – liver, colon, breast and pancreas. Soluble fiber pectin found in apples increase satiety, reduce cholesterol and decrease the risk of diabetes by preventing blood sugar swings. The fibers also help to improve digestion and relieve constipation and irritable bowel syndrome. Quercetin found in apples boosts the immune system. Walnuts – Walnuts are a wonderful source of plant-based omega-3 fatty acids along with biotin, copper, manganese and molybdenum. Regular consumption of walnuts can reduce the risk of prostate cancer and breast cancer and slow down tumor growth. Amino acid l-arginine present in walnuts improves heart health. Powerful antioxidants present in these nuts combat free radicals and neutralize the damage caused to cells. The neuroprotective compounds, including vitamin E, folate, melatonin, omega-3 fats, and antioxidants in walnuts support brian health. So, what are you waiting for? Overhaul your age-old eating habits and start your day with a filling and tasty breakfast salad and get your daily dose of proteins, vitamins, minerals, fibers and healthy fats – all of which are essential for maintaining overall health.